1992, Intaglio print on paper. This was how Father William O’Halloran let me know that my proposed sculpture installation for Swords Hall would not be allowed. Fr. O’Halloran was Vice President of Holy Cross in the spring of 1992 and he had, earlier in the semester, allowed me to install a sculpture temporarily in front of Hogan Campus Center. That success inspired me to try again. In retrospect, I understand that every proposal made by an undergraduate seeking attention for his art cannot be indulged. But it was how he said “no” that was disturbing to me. The dialogue drifted into a polemic on the definition of art and its value. This was an argument that I wasn’t going to win. The piece would not be displayed. Though I couldn’t install the work, I didn’t let the conversation end there. 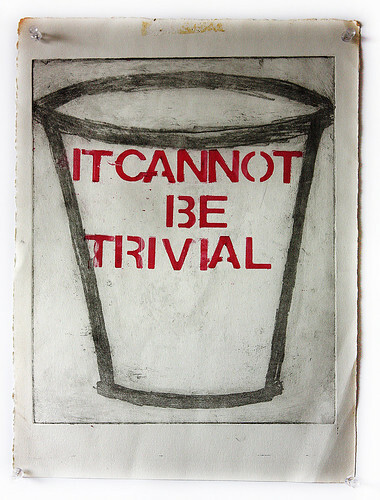 I made 18-20 intaglio prints of a trash can on paper and stenciled each with one of Fr. O’Halloran’s statements in red ink. I posted them throughout Fenwick Hall, the main academic building on campus and home to the deans (mostly Jesuits) and Fr. O’Halloran. After about a week, only a few remained, which I decided to take down and save. Fr. O’Halloran and I didn’t discuss art ever again, but it got back to me that a few faculty had taken the prints and put them up in their offices. The words and definitions of “it” as “art” stuck with me. They became the seeds of inspiration for many future works about art, religion, and safety.